Apollo® Model MVE Emergency Mixing Valves are designed to ensure safe and reliable delivery of tepid water to emergency eyewash / face wash fixtures. The device includes a patented temperature and flow control feature in the event of cold water, hot water, and thermostatic element failures. Patented Hot and cold water supply failure protection. Tepid water temperature limit control. Locking handle for tamper-proof protection. Integral inlet check valves and strainers. The Apollo® Model TV (34-200 Series) thermostatic mixing valve provides non-ASSE extension of water heater capacity and hot water temperature control in hydronic heating systems. Available in low or high temperature options for floor or baseboard applications. 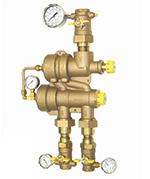 The Apollo® MVA-H master mixing valves are designed for hydronic applications. They provide accurate temperature control in hot water heating distribution systems where the service temperatures are outside the scope of ASSE standards. Valves are available with multiple connection options to suit your application. 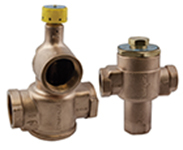 Apollo® MVA (34A Series) and MVA-LF (34A-LF Series) thermostatic master mixing valves are designed for ASSE 1017 "Point of Source" approved applications. They provide hot water temperature control of potable and non-potable hot water distribution systems. Models can be configured with several connection options to suit your application. 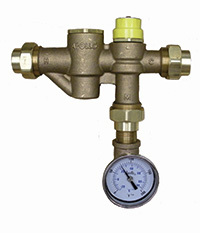 The valves are built using "Lead Free" materials and are available with a variety of options and end connections. Dual Purpose ASSE thermostatic mixing valves are designed to control and limit the volumes of cold and hot water required to deliver mixed water at a predetermined temperature either from the "point of source" or "point of use" application for single or multiple fixtures. Hot water limit devices, ASSE 1070, built using Lead Free materials. Superior thermostatic element technology for optimum reliability, dependability, and accuracy. Integral strainers and check valves provide protection against cross-flow and foreign particles. The Apollo® Model MVC (34C Series) are Commercial Master Mixers, ASSE 1017 approved, thermostatic mixing valves designed for high capacity commercial and institutional "Point of Source" applications. Featuring ease of maintenance and "Best in Class" flow rates, they provide reliable temperature control for large hot water distribution and hydronic heating systems. The Apollo® Model MVCLF (34CLF Series) are ASSE 1017 approved thermostatic mixing valves designed for high capacity commercial and institutional "Point of Source" applications. Featuring ease of maintenance and "Best in Class" flow rates, they provide reliable temperature control for large hot water distribution and hydronic heating systems. The Apollo® MVHL Automatic Temperature Controller / HI-LO meets the new ASSE 1069 standard for multiple shower applications and the ASSE 1017 standard for point of source distribution applications. The device provides consistent temperature control to flow as low as 0.5 GPM. The MVHL is capable of low flow control without need for recirculation pumps and higher flow with parallel installation. 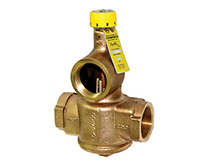 Integral strainers and check valves are supplied at the valve inlets for added protection and long term performance. "Point of Use" ASSE 1070 Mini Mixing Valve.